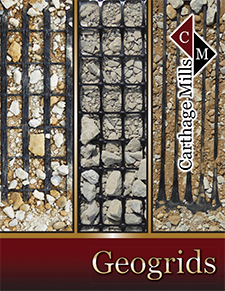 The biaxial geogrid staple of the geosynthetic industry for over 30 years is now available at Carthage Mills. The Carthage GBX® Series of integrally formed biaxial geogrids – including commonly referred to Type 1 and Type 2 – are produced of the highest grade polypropylene (PP). The GBX Series is a competitively priced full-line of biaxial geogrids that employs the same combination of technology and materials which have demonstrated decades of proven success in the United States and throughout the world. Design Engineers can specify with confidence that the GBX Series of geogrids will provide the cost effective performance and reliability that the industry has come to trust. Contractors can be assured of seam-less submittals and project approvals when the GBX Series of integrally formed geogrids is their product line of choice. The Carthage GBX Series of biaxial geogrids is the result of decades proven technology. They provide the high flexural rigidity and tensile strengths along the ribs and at the junctions that are required for long-term interlock and confinement in Soil Stabilization and Base Reinforcement applications. MATERIAL AND MANUFACTURING PROCESS Decades proven and worldwide tested for confidence in perform-ance and reliability you can trust. COST EFFECTIVELY INCREASES LOAD BEARING CAPACITY Facilitates the construction of haul roads and staging areas over soft soils versus expensive and time consuming chemical stabilization or deep undercutting. BASE REINFORCEMENT / STABILIZATION High Tensile Strengths, Junction Efficiency, Flexural Rigidity and Aperture Stability confine and restrain aggregate from lateral movement, distribute applied loads over the subgrade, minimize rutting, reduce aggre-and provide a predictable and reliable level of performance to enhance pavement life. COST SAVINGS – MATERIAL Available roll widths up to 16 ft. minimize installation labor and material waste. COST SAVINGS – PROJECT/SITE Proven reductions in fill or aggregate thickness, hauling and equipment hours, undercutting, and rutting. Savings in structural materials alone have been as much as 50%. Base Reinforcement for paved highways and secondary roads, runways, and parking lots; railways. As gabions for wall construction, erosion control structures and bridge abutments. Stabilization/Reinforcement in haul roads, parking areas, equipment and staging yards. Working Platforms/mattresses on weak subgrades such as soft soils, peat, tundra. Foundation, cement or concrete reinforcement in a wide variety of applications.